Tears welled in his eyes the first time Jerusalem Police Officer Nir met his marathon training partner. That’s a typical reaction upon encountering the children at ALEH , Israel’s largest network of facilities for children with severe physical and cognitive disabilities. But it wasn’t long before Officer Nir regained his composure and bonded wordlessly with his seven-year-old charge. Each Sunday morning, they practice two hours to prepare for the 800-meter “Community Race” at the fifth annual Jerusalem Winner Marathon on March 13. 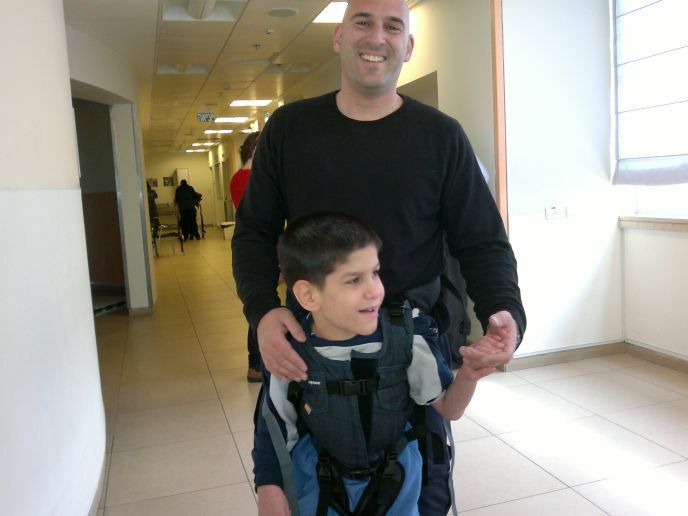 Physical therapists at ALEH’s Jerusalem facility taught Officer Nir how to harness himself to the child using an innovative Firefly Upsee, invented by Israeli mother Debby Elnatan to give adult-aided mobility to kids unable to walk on their own. When ISRAEL21c visited on a Sunday morning in February, about 18 police officers were at ALEH, training as they’ve done each week since early October with their marathon partners, using Upsee harnesses, walkers and other mobility devices. Their volunteering resulted from a presentation given at police headquarters by ALEH at the suggestion of an officer whose sister is an ALEH resident. She wanted to get her coworkers involved with the children, and ALEH administrators realized the cops could help kids enjoy the thrill of a marathon – even if it takes a couple of hours to complete the non-competitive track. Officer Nir using an Upsee harness to train with his ALEH partner. From the Jerusalem Marathon’s first year, able-bodied runners have participated to raise money for ALEH as well as 24 other charitable causes. ALEH volunteers pushed some of the kids in wheelchairs around the community track, and each child was rewarded with a medal. “Our main goal was to raise awareness and model inclusion,” says Dov Hirth, head of international public relations for ALEH’s four facilities. “We have a few hundred people running on behalf of ALEH, a ton of volunteers, and a lot of high-profile people who want to be involved.” For example, last year supermodel Esti Ginzburg came by to encourage ALEH’s contingent. Before the 2014 marathon, one of ALEH Jerusalem’s physical therapists suggested that some of the children, if properly prepared, could do more than be pushed in a wheelchair. Responding to this challenge, members of the staff worked hard to train a small group of carefully selected children for the Community Race. Having 18 Jerusalem police officers take over the training has allowed the number of participants to be expanded to 15 kids chosen for their ability to be outdoors for an extended period and to walk with assistance. A few of the kids need more than one adult by their side. The volunteers had to be trained too, in order to understand how to use the mobility devices and how to communicate with non-verbal children. A blink, a smile or hand gesture can have great meaning. “In our facility we only speak the language of the heart,” says Hirth. 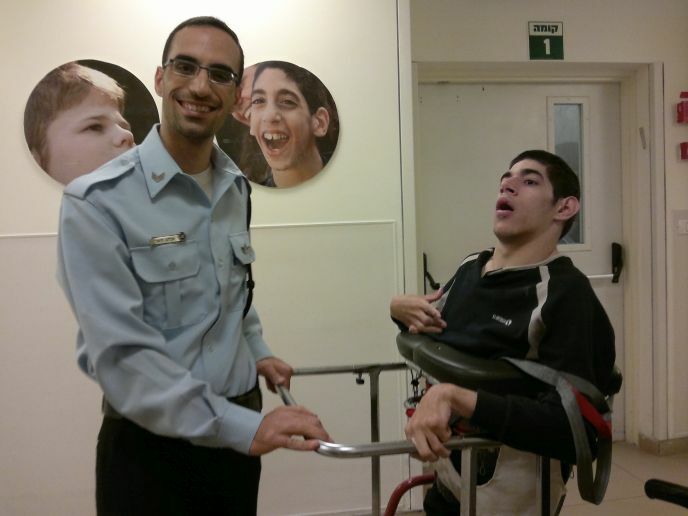 Officer Elchanan training with his ALEH partner. Occupational therapist Rivka Keesing, director of academia and research for the organization’s four branches, is amazed to see police officers coming even on their days off so as not to miss a practice. One officer is paired with a little girl who doesn’t live at the facility but with her family an hour and a half from Jerusalem. Staff and volunteers will bring most of the facility’s 106 children – along with medical equipment and support staff — to the track on marathon day, just to experience the excitement.